Need to Grow a Thicker Skin? So how can we learn to adapt and roll with the punches? How do we bounce back and continue with our day? Create a “Book About Me.” Now, don’t roll your eyes at this one. I know it may be hard to focus on yourself, but this helps immensely in the long run. 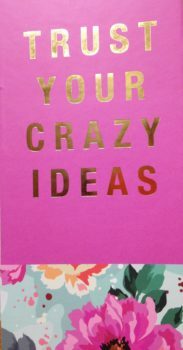 Go out today and buy a notebook in your favorite style or color, then begin to fill it with anything and everything you have accomplished over the years. It could be a photo of your graduation, a certificate you won at the office bake-off or that medal you earned when you completed a marathon. 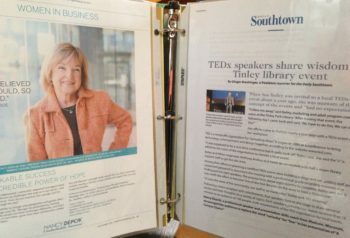 In my “Book About Me,” pictured on this blog, I have anything relating to my Professional Speaking career. Then on those days when life gets a little complicated, I leaf through my book. It’s a great reminder of just how far I’ve come. Have an honest conversation with yourself and ask yourself what is really bothering you. Is it something from your past that has resurfaced? Is there a spark of truth in what the other person said and you just don’t want to face it? For me, if I can understand WHY I’m feeling hurt, then I can focus on resolving the problem. Many times, it’s the hurtful comments that have lead me to my greatest accomplishments. This one is the hardest for me – not everyone is going to like me. There are people that I will disappoint and I cannot be everything to everyone. At those times, I take a deep breath and ask: Have I satisfied the most important person in my life – am I happy with myself? If the answer is no, then I have to take a hard look at making some changes. If I can answer yes, then I can rest my head at night, knowing it was a good day. Give these a tips a try and see if you’re able to let go of the small stuff. It takes practice. Just keep trying and know that you are doing the best that you can. You’ve heard it a million times – Follow your passion! But what the heck does that mean? What is “a passion” – and where do you find one? Many years ago I was watching an Oprah show and she talked about a workbook that could help you find your passion. A workbook that I could buy, and with a little time invested, would help me find my passion and lead me to my happiest life ever. So, as you can imagine, I bought that workbook as fast as I could. I’d love to share the title with you if I could remember it, but as you probably already figured out, it led me nowhere. Wait! What??? When did I figure that out? After all this time and work and concentration, I still had no idea what I wanted to do with the rest of my life. I had no idea what my passion was. Frustrated and exasperated, I threw the book away. Now, many years later, I can honestly say that I have found a career that I am passionate about. Being an Inspirational Speaker has brought me joy greater than I ever imagined. Are there parts of my job that I’m not that crazy about – absolutely. But I look forward to getting up each morning and facing the day. What are your real interests. Make a list of what really brings a smile to your face. What is boring to you? Again with the list – figure out what you dread to do. What do you consider meaningful? The environment? 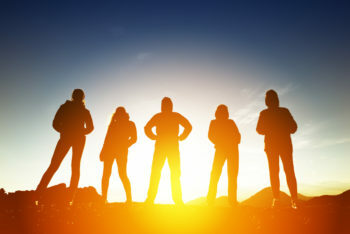 Helping people become their best selves? There are no wrong answer here. No one, including yourself, is judging you. When you can overlap your interests with your purpose, you are on the right track. Figuring out the answers to the above questions will get you headed in the right direction. The key is to START. Now go find that passion! Fingers Crossed – This Will Be Me! 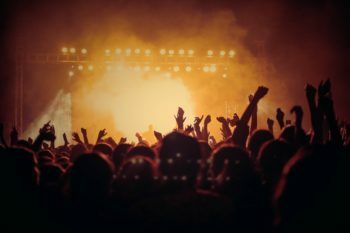 “Disoriented and dazed” – How two elderly men felt after escaping their nursing home and going to a heavy metal festival. Now I understand this wouldn’t be so amusing if someone got hurt, but in this case, everyone was found and returned home safely and all in one piece. The age of these gentlemen wasn’t revealed in this article, but I could just picture two elderly men sneaking out of their nursing home, just like teenagers, and finding their way to a heavy metal concert. It was 3:00am when they were found and they did not want to leave the four-day festival. How did they get there? I have no idea. But I love the fact that they refuse to let their old age stop them from living. It didn’t matter how old they were – they still wanted to have fun, explore and take a chance. If you’d like to read more, check this out: https://bit.ly/2Oc3VY0. Truly, I hope I’m lucky enough to be this feisty and adventurous and filled with fun for the rest of my days. I’ve met so many people who say: “I’m too old for that.” My hope is that those words never cross my lips and that I live every moment in wonder and gratitude and laughter. I often think of the quote by Rose Tremain: “Life is not a dress rehearsal.” We get one chance, so give it your best shot. Whether it’s biking or knitting or cooking or … heavy metal concerts.